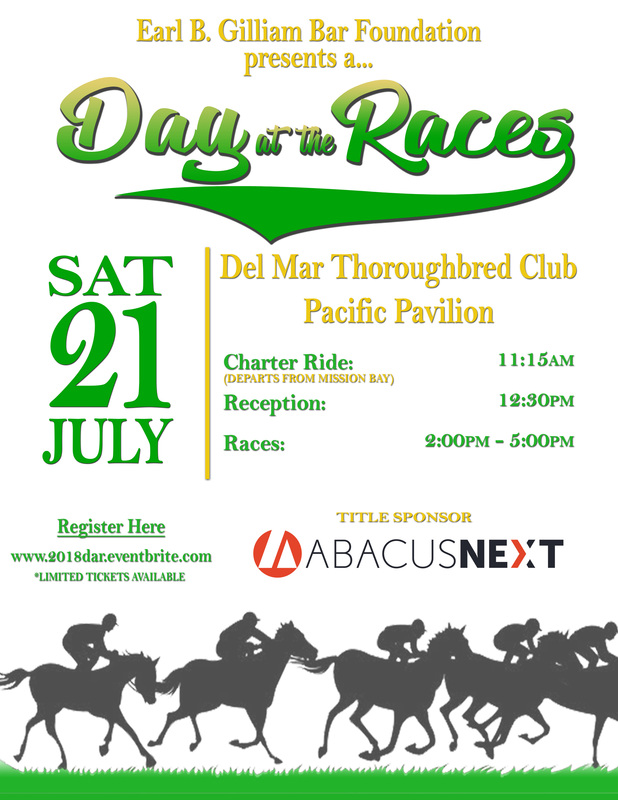 The Earl B. Gilliam Bar Foundation is hosting its annual “Day at the Races” event at the Del Mar Thoroughbred Club on Saturday, July 21, 2018! Grab your fancy hat or outfit and join us for a fun day as we cheer on our favorite horses while mixing and mingling with other legal professionals. Also, enjoy a catered reception hosted by our Title Sponsor, AbacusNext! This is also a great opportunity for various representatives of professional organizations across San Diego to connect, network, and socialize in an informal setting. Proceeds from this event will help further our mission of representing the interests of the African American community and diversifying the San Diego legal community. We fufill our mission by providing scholarships to law students to advance their legal education, and resources for attorneys to retain and grow their presence in the field. Come learn more about our Foundation and enjoy the races!